NEW YORK (CNNfn) - Bridgestone/Firestone Inc. said Tuesday it would reimburse customers up to $100 a tire for exchanging tires involved in the company's voluntary recall and began running ads in 41 newspapers nationwide Wednesday detailing the reimbursement policy. 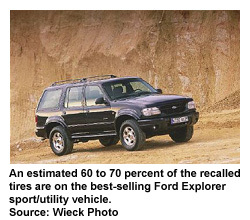 On August 9, the Nashville, Tenn.-based unit of Japan's Bridgestone Corp. recalled 6.5 million of its ATX, ATX II and Wilderness models, more than 60 percent of which come as original equipment on Ford Explorers, Mercury Mountaineers and other sport utility vehicles, because of complaints the treads are separating and causing fatal accidents. Firestone announced its reimbursement plan just hours before the National Highway Traffic Safety Administration raised the number of deaths it was investigating possibly related to the recalled tires from 46 to 62. The NHTSA, a unit of the U.S. Department of Transportation, said it has now received 750 complaints from consumers about the tires. And in a letter to Secretary of Transportation Rodney Slater dated Monday, U.S. Sen. John McCain (D-Ariz.), the former presidential candidate, urged expansion of the recall and expressed concern about the government's methods for collecting and reporting defect data. During a briefing with reporters Tuesday, John Lampe, the company's executive vice president, said the company has already replaced more than 100,000 of the tires and has doubled production, ordered competitors' tires and imported tires to help meet demand. Lampe said the recall would cost the company $350 million for 2000. Bridgestone/Firestone said customers who paid to replace the Firestone P235/75R15 Radial ATX and Radial ATX II tires made in North America, and P235/75R15 Wilderness AT tires made at the Decatur, Ill., plant will be fully reimbursed. We hope to quickly reimburse customers for costs they may have incurred replacing tires that now have been recalled," Lampe said. Lampe said the reimbursement policy covers Firestone tires as well as competitors' tires purchased as replacements retroactive to January 1, 2000. "We believe this is a simple and fair way to make things right for our customers," Lampe said. Tires purchased between Jan.1 and Aug. 8 from a company-owned Firestone Tire and Service Center, or authorized Bridgestone/Firestone retailer are covered in the policy as well as competitors' tires purchased between Aug. 9 and Aug. 16 at non-Firestone stores. Customers will be reimbursed up to $100 a tire including mounting and balancing charges and taxes. If Bridgestone or Firestone tires are not available, company-authorized retailers are instructed to find equivalent competitors' tires, the company said. Bridgestone is using the ads in 41 U.S. newspapers to inform customers about the reimbursement policy and instruct them on where to find their tire model numbers. Ford began running such ads on Sunday. The information will also be available on the company's Web sites www.bridgestone-Firestone.com or www.Firestonetire.com. Despite these actions, McCain said in his letter that the recall, which is being done in phases beginning initially with Arizona, California, Florida and Texas, should immediately be expanded to simultaneously include all states. 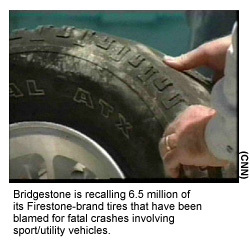 "While I appreciate the efforts of Bridgestone/Firestone Inc. to address a potentially life-threatening safety matter, I have serious doubts that consumers in all states will be adequately protected using this type of phased recall," McCain said in the letter. McCain also urged scrutiny of the NHTSA's data collection and reporting systems to detect defects amid reports that lawsuits involving the tires began as early as 1992. During Tuesday's briefing, Ford Motor Co. (F: Research, Estimates) spokesman Tom Boughman said Bridgestone/Firestone would not "lose any business from Ford" because of the recall, but was less certain when asked if the No. 2 U.S. automaker would expand the use of Firestone tires as original equipment on other vehicles. Baughman's comments reiterate the company's statement Monday that it will continue using Firestone tires, but step up quality monitoring at its plants. Both Ford and Firestone officials said Tuesday that a broader recall is not necessary. Officials are continuing to investigate why the tires are failing, enlisting help from Ford, which has had a close relationship with Firestone since 1906. Reports indicate the treads are peeling off their casings, sometimes when the vehicles are traveling at high speeds. Ford's Chief Executive Officer Jac Nasser dismissed consumer groups that have criticized the two companies for not having acted sooner, saying in an interview with Reuters that the groups have "no facts, no data about Firestone's tire recall." But Nasser acknowledged to Reuters that Ford might consider diversifying its tire sourcing in the future. 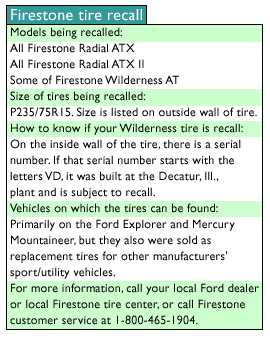 A focus of the investigation has been manufacturing processes at the Decatur plant where many of the recalled tires were manufactured. The company denied suggestions from critics that replacement workers hired at the plant during a 1994-1995 strike were the cause. Because many of the incidents occurred in southern states, officials have said they suspect heat could be a factor. However, Lampe said Tuesday he believes the investigation will reveal that many of the tires failed because of improper maintenance. Officials recommended keeping the tires inflated to at least 30 pounds per square inch (PSI), but not to let tires fall below 26 PSI. "Tires are not bullet-proof. A leading cause of any tire problem is maintenance, especially inflation and poor repair," Lampe said. "That in a high number of places will be the cause." Lampe said Firestone has also increased the number of people in its stores and customer service representatives to handle the overwhelming number of inquiries from concerned customers.